One World Surgery needs surgical/scrub techs and nurses on most of its brigades, and with this new scholarship program, ASCA hopes to help fill these spots. 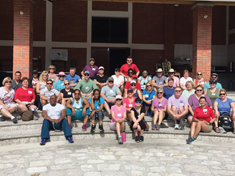 In March 2018, ASCA invited me to join One World Surgery at its ASC in Honduras to help kick off ASCA’s new scholarship program. The scholarship program is designed to help people who want to go on a medical mission trip but cannot finance the trip on their own. ASCA uses revenue derived from its affinity partners program to fund this scholarship program. The opportunity to participate in these medical mission trips is open to everyone, not just people with a clinical background. It takes a healthy mix of clinical and non-clinical volunteers to have a successful week. A person without clinical experience can volunteer at the surgery center turning rooms over, washing instruments, taking out trash, helping with breakfast and lunch, etc. If they do not want to help at the surgery center, there are other things they can do to experience the ranch. Some of our volunteers helped care for the children, made meals for the children or made meals for our team. The staff onsite put up a volunteer list every evening so that people could pick what they wanted to help with the next day. This trip was much more than I expected. I have spoken with other physicians who go on medical mission trips in other countries, and they talk about their experience of performing surgery in a tent or in a facility without air-conditioning. They also talk about several surgeries going on in the same room at the same time. This was not my experience at all. One World Surgery’s mission is to ignite the spirit of service and transform lives by providing access to high-quality surgical care globally. Every case performed follows the same processes as we do in the US. The patients are treated the same as we would treat our patients, and they receive the same surgical care we provide in the US. For one patient who came to us with severe anemia, we needed to obtain blood—something that ASCs in Honduras are allowed to provide. One World made accommodations for this patient for an overnight stay before surgery. Then, they type- and cross-matched him for blood and traveled into town that evening and the next day to get the supply they needed. This patient’s surgery was the last case we performed on Friday, and One World made accommodations to keep him overnight or as long as needed until he was stable and could return home. This gentleman had been in the public hospital for two weeks with no hope, and his condition was deteriorating. One World Surgery gave him hope and gave him his life back. There is no greater joy for me than to go to Honduras and be a small part of giving the gift of surgery to people. These people have been to the public hospital and other places, and they come to One World with their last ounce of hope for help. After their surgery is finished, it is priceless to see the happiness and gratitude on their face. I’ve seen a woman, hours after total knee replacement, when she was walking for the first time, crying and singing with joy because she was so happy. Another woman, who had been through several devastating events in her life, was given the gift of sight after cataract surgery. This woman brought tears to the staff’s eyes as she explained what a blessing it was to be able to see again. Everyone should experience the medical mission field once in their life. One World Surgery is a safe environment and far from the “roughing it” experience you might find on other medical mission trips. This is a trip for the whole family, from children to older adults. Apart from the surgery center, the orphanage on the ranch that serves as home to more than 250 children is a very rewarding place to spend time. Once you go to Honduras, you will leave a piece of your heart and a desire to return. I’ve already scheduled another trip for 2018 and signed up for a third trip in October 2019. I have developed friendships for life between the Hondurans there and my new friends from the US. This trip has changed my outlook on life and what is really important to me. In the end, what really matters is the lives we touch along the way and the people we help. Cindy Young, RN, CASC, is the administrative director of the Surgery Center of Farmington in Farmington, Missouri. Write her at cyoung@surgerycenter farmington.com. Cindy Young, RN, CASC, is the administrative director of the Surgery Center of Farmington in Farmington, Missouri. Write her at cyoung@surgerycenterfarmington.com. The advice and opinions expressed in this column are those of the authors and do not represent official Ambulatory Surgery Center Association policy or opinion.